The latest auto and employment numbers paint a picture of an economic recovery that remains tepid and potentially fragile. 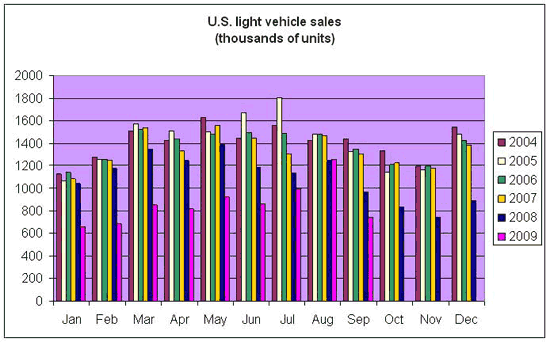 September was the worst month for U.S. auto sales since February, down 23% from September 2008 and down 41% from the August 2009 outlier. Many of us had wondered whether the cash-for-clunkers program would simply cause people who would have bought cars in September or October to buy instead in July and August. Now we seem to have an answer, though General Motors Sales Chief Mark LaNeve believes that low inventories also lost the industry 300,000 potential sales for September. If you average the three months of July, August, and September together, the impression is one of improvement since the terrible first quarter that’s still left us below 2008:Q3. Inventory rebuilding should give a cyclical boost at some point, but at the moment this is not looking at all like the sharp recovery some had been hoping for. 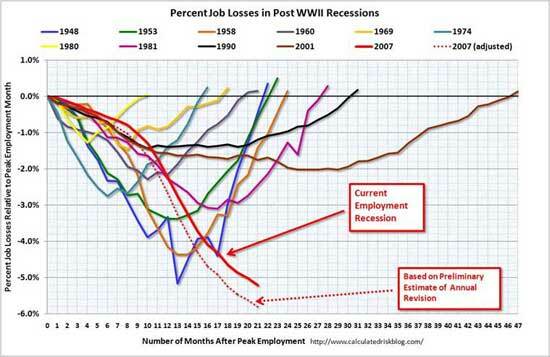 But the biggest worry remains employment. Initial claims for unemployment insurance and number of hours worked are often viewed as leading economic indicators. Initial claims peaked in March, but have improved little since August. Seasonally adjusted new claims for unemployment insurance (red) and 4-week average (blue), in thousands. 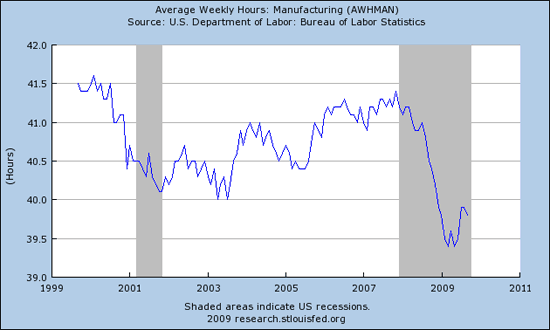 Average hours per week in manufacturing fell back a bit last month, undoing some of the earlier rebound. 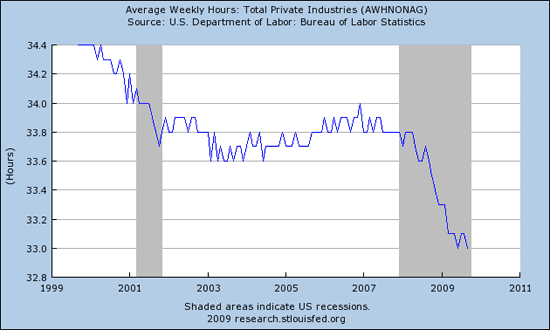 Hours worked for the broader economy remain at the low point for this cycle. And total employment, generally regarded as a coincident economic indicator, continues to plummet, with a quarter million fewer Americans on payrolls in September compared with August (seasonally adjusted). That this is not as rapid a decline as we saw at the start of the year can no longer provide much comfort to anyone. 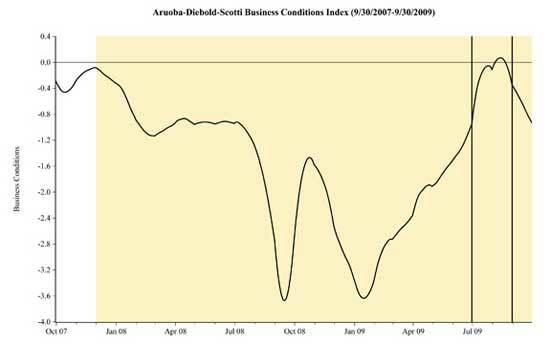 The Aruoba-Diebold-Scotti Business Conditions Index also doesn’t care much for the latest numbers, having moved back into significant negative readings. Although I expect the GDP numbers later this month to show positive growth for the quarter, further deterioration on jobs is bad news for critical factors like loan defaults and total spending. Carpe Diem has his usual optimistic take on this. Wish I felt the same way. The Pain Has to Go Somewhere, But Where?